It's not true that everything is upside down Down Under; it just feels that way sometimes. Consequently, we gave ourselves a few days after landing in Auckland, New Zealand to get used to looking right before crossing the street, to study a brand new night sky, and to figure out something we eventually called "The New Zealand Half Flush." We enjoyed watching the America's Cup races (see if you can find the two white sails), doing the coast-to-coast walk (from the Pacific Ocean to the Tasman Sea), and some unexpectedly strenuous biking on a very hot, sunny Waiheke Island. 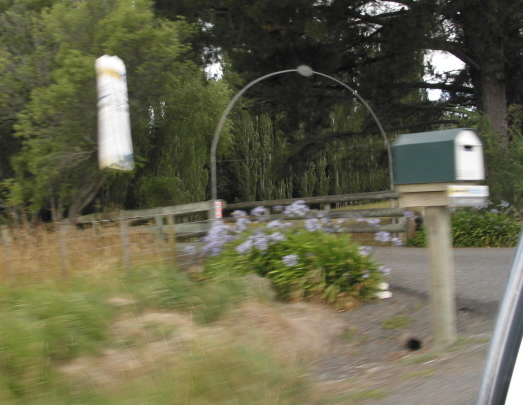 But everyone told us "New Zealand's not about the cities," so into the countryside we went. After a brief, abortive attempt to hitch-hike out of Auckland (instead taking a bus a few hours out of the city) we finally got into the "hitching" groove. 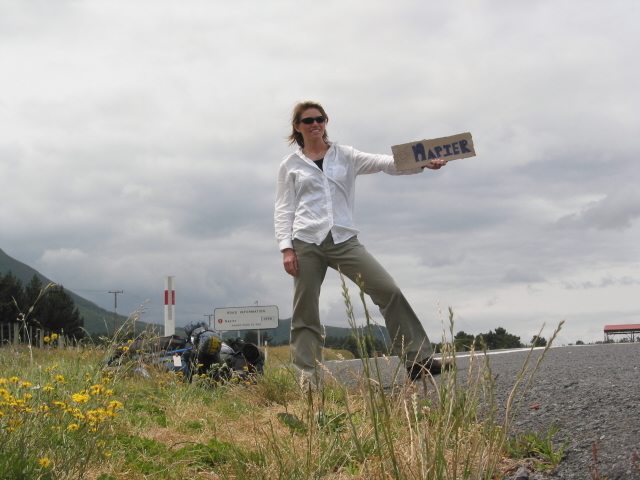 We got three rides the next day (from a small business owner, a forest ranger, and a young lawyer) to the city of Napier in a region called Hawke's Bay. We were just a week ahead of harvest-time so the trees and vines were full with fruit, a special treat. While in Hawke's Bay we opted for the five hour walk to see a rare mainland colony of Gannets rather than the hour long tractor ride. Guess which one was free? It is a theme that has been, and surely will be, repeated many times on The Enchilada. "Don't Worry, They'll Find It." 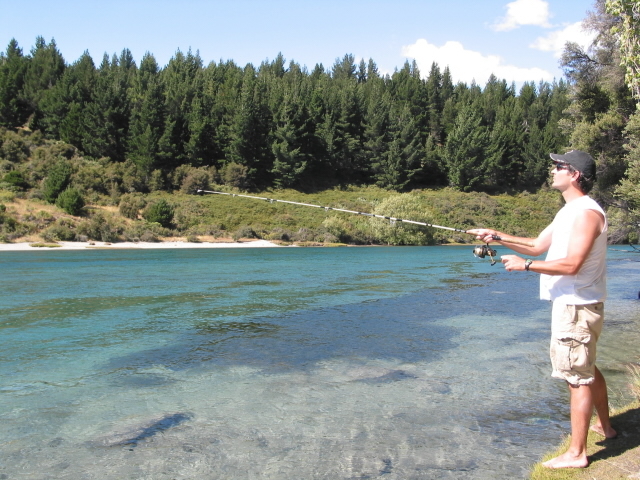 One reason we chose hitching as our way to travel the North Island is the adventure of never knowing what kind of experience you'll get. 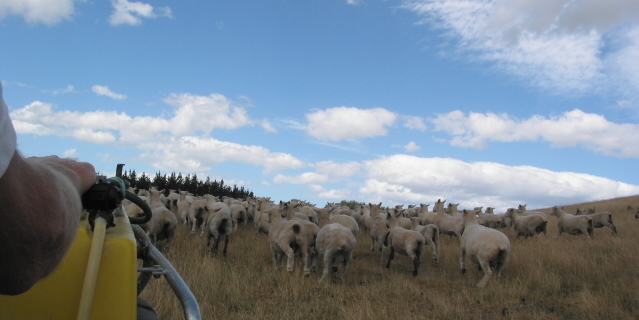 Take our ride to the Lochlea Farm for example. The only way to this farm-stay hostel (or, backpacker, as they call them here) was to jump in with Kathy, who was delivering the afternoon newspaper. You can image what happens next: with stacks of newspapers on our laps, crusing along at 50 miles per hour, Kathy would yell "That mail box!" or "In this driveway!" and we would fire away. After many of our throws Kathy was left to console us with a "Don't worry, they'll find it." The farm-stay was well worth the work to get there, though. 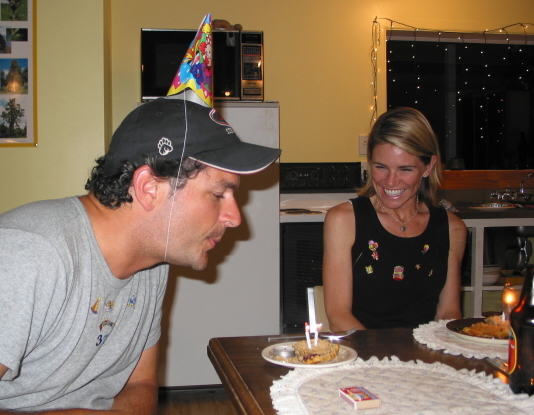 Not only did Garvin celebrate his 37th birthday, but the next day the farmer took us on the back of his 4-wheeler as he, his son, and three dogs herded some 300 sheep across his 450 acre farm. 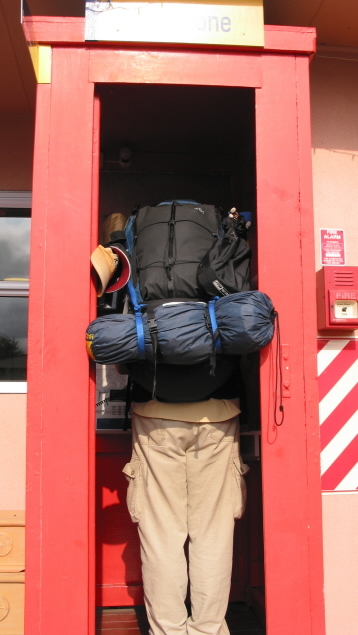 After Lochlea, and after mailing some belongings home (our packs were still too heavy), it was on to Wellington. Thanks go out to the Flinkenberg family (Pam, Con, and Max) for all their hospitality in their beautiful home with the beautiful view. We also saw the terrific Lord of the Rings exhibit at New Zealand's national museum, Te Papa. Even with all the hype, Kiwi's love and are proud of those movies. "Stay to the left. Left! LEFT!" 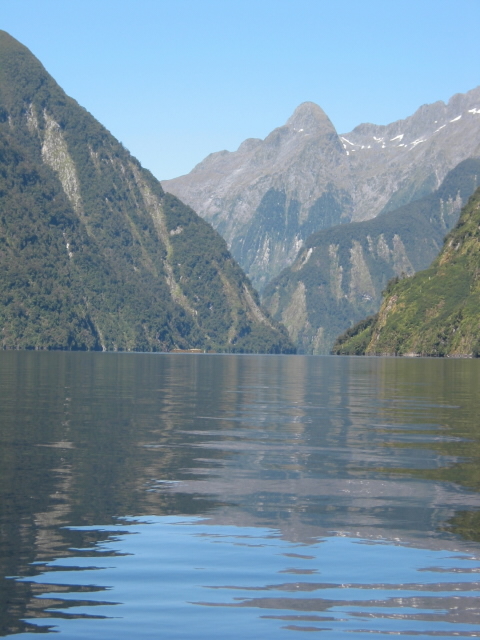 A smooth three hour ferry ride took us from the North Island to the South Island. It also took us from the relative safety of hitch-hiking to something really dangerous: driving ourselves. 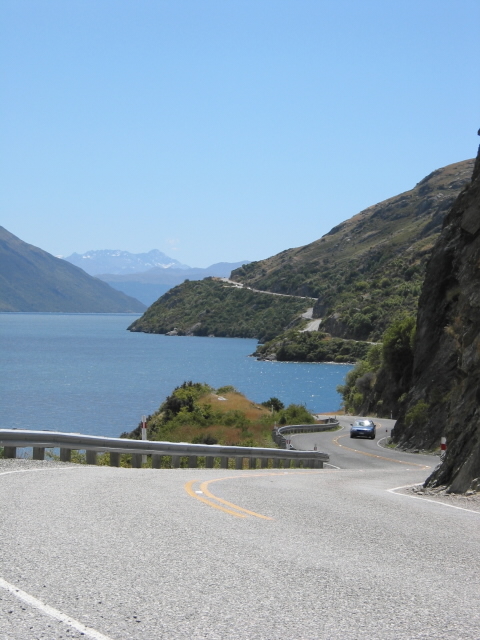 Not only is there the left-side driving thing, but the South Island is chock full of winding, narrow, mountainous roads complete with insane 60 mph speed limits. When not on one of those, you're just as likely to come across a one lane bridge on one of the country's main roadways with railroad tracks thrown down the middle for good measure. 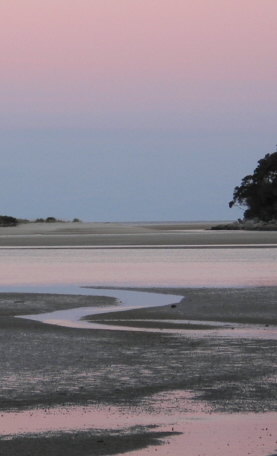 First stop on the South Island was an overnight hike ("tramp" is what the Kiwi's call it) in Abel Tasman National Park. Nine miles with a full pack was good training for future adventures. From rain forests to white, sandy beaches this hike had it all, including unexpected and unwanted wildlife. Sometime between two and three in the morning a possum found it's way into our food stash. Startled by the rustling of plastic, Karen awoke to find the furry critter outside the tent. It was up to the Enchilada duo to come up with a plan or risk going hungry the next day. Needless to say "Operation: Grab Grub" was a success. 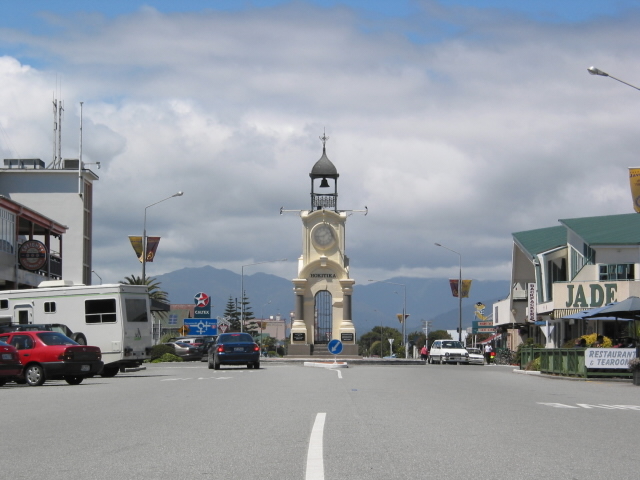 Further south was the lovely seaside town of Hokitika (don't you just love the sound of that). We pitched our tent just steps from the Tasman Sea and enjoyed our coffee at sunrise, beers at sunset, and a driftwood fueled bonfire with fellow backpackers. We also treated ourselves to a movie at one of the funkier theaters you'll ever find. We sat in old car seats, brought in our own food and drink and watched the Argentinian flim "Nine Queens." Life is good. Next it was on to the beautiful lakeside town of Wanaka. There we had the pleasure of meeting, staying with, and helping to move John and Karla Bailey. We failed to catch any trout for dinner that night but still were invited to a wonderful BBQ the first night in their new home. 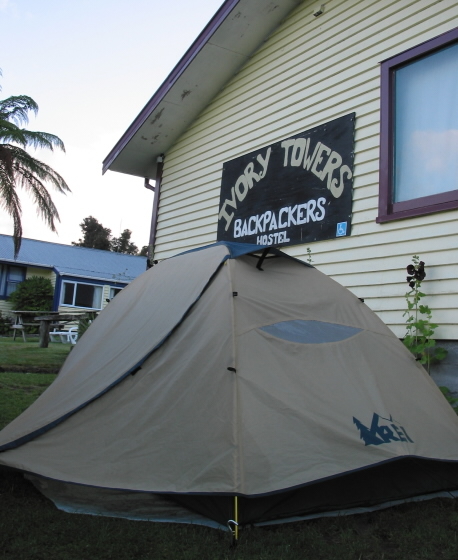 By this point of the trip we had settled on our preferred style (and price) of accommodation: setting up our tent outside of backpackers instead of sharing dorm rooms inside. We did this as we visited the magnificent Fox Glacier. 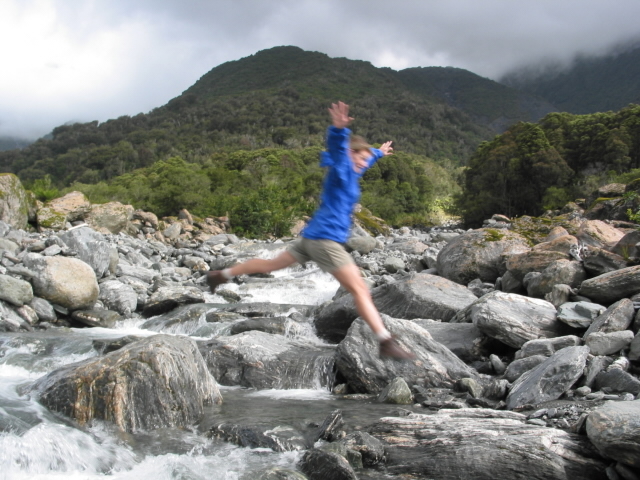 Our multiple, short hikes in the area called for, at times, skillfull and graceful fording of rushing rivers. Then came time for our one splurge in New Zealand (by "splurge," of course, we mean actually paid for). 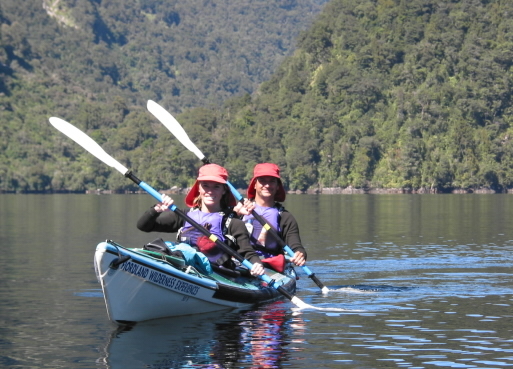 It was a two day kayak trip on Doubtful Sound in Fiordland National Park. Day one saw weather so beautiful our guide said one is lucky to see a few days like this in a lifetime. Night one saw our introduction to the sandfly, whose number and tenacity puts any bug we've ever seen to shame. 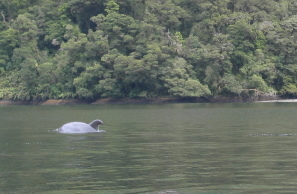 Day two was a highlight of the trip: bottle-nose dolphins and blue penguins swimming by our kayaks. A few days later on the east coast we saw more penguins, but this time it was the rare, yellow-eyed penguin (trust us, they do have yellow eyes). 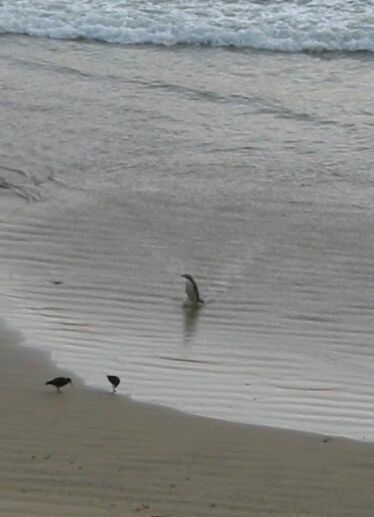 An hour and a half waiting in a blind paid off when one rode a wave into shore, stood up, and began waddling just like, well ... just like a penguin. "He's Heading Around the Left Ear!" We happened to be in a position to see the penguins because we were hanging out in the town of Balclutha waiting to see the local sheep shearing championships. 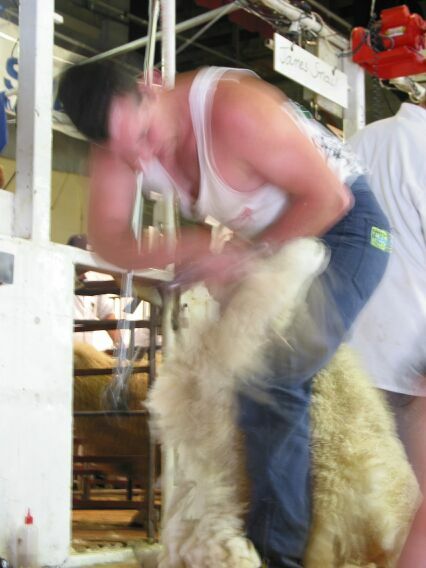 Once the finer points were explained (going over a missed spot, or "second cutting" is not good) we appreciated the skill and speed of the shearers. Still, we couldn't help giggling at the play-by-play ("Fagan's going in for sheep number 5, but once Kilpatrick's done with the brisket, and ... oh no, he's got a kicker, he'll be right up with the leader). So now we're off to Sydney, a few days sooner than we expected (good thing we double checked our tickets ... that could have been a disaster, an embarassing one at that). Although, it wouldn't have been the worst thing in the world to spend more time in New Zealand, Australia awaits. 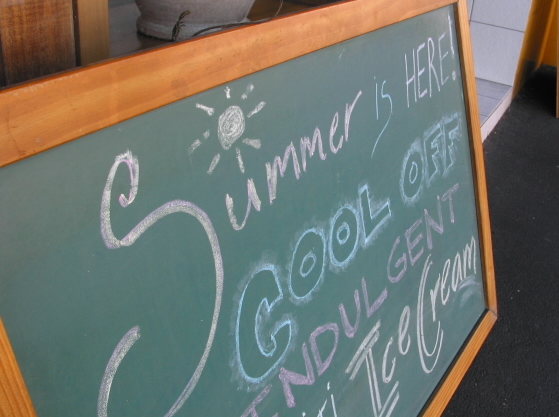 Once more, your reward for reading this far are more pretty pictures.